This little logger and its dedicated PC software package ‘PowerPackPro’ combine new technology and years of experience to punch well above their weight surveying single phase and balanced 3 phase loads. The SPCMini has all the features you'd expect in 21st century data logging equipment at an extremely competitive price. It has a large clear display, a massive 'Flash' memory - enough for 1 minute logging for over a month - and of course, it's completely secure. Setup and data download is via a simple USB connection, for fast and reliable communication with any Windows PC. 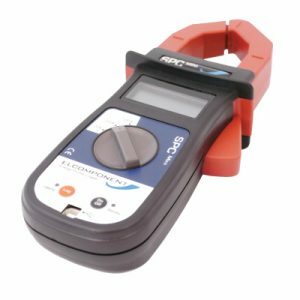 The SPCMini is one of our extremely versatile data loggers and will provide accurate results on loads as small as 2 amps, right up to a maximum of 500 amps. It's designed for single phase and balanced 3 phase loads (such as motors) and the logging interval is fully adjustable from 1 second (for hi-resolution on surveys of up to 36 hours) to 20 seconds for surveys of up to 4 weeks (the limit of the battery life). Our 'PowerPackPro' software package, has been developed specifically for the SPC family of data loggers and download modules, and has won many plaudits for its ease-of-use and helpful, task-oriented. The SPC Mini is simplicity itself to hook up. It clips on to the cable to be measured just like a clip-on ammeter, and like a clip-on ammeter it will provide an instantaneous display of the current flowing - ideal for identifying the correct load. Starting a survey is as easy as pressing a button, and the command is confirmed by the front panel leds, so you can be confident that data are being recorded. For appliance loads or any application where a 2 core or 3 core flex is present, we recommend the SPC Cable Splitter for easy access to the supply cable. It makes life a lot easier! Download is equally easy - simply plug the USB lead into your PC and the PowerPackPro software will find the logger automatically and guide you through a foolproof sequence to ensure that accurate results for current, kilowatt hours and cost are configured for immediate viewing. The instrument uses a completely secure and non-volatile 'flash' memory and has its own back-up for its on-board clock, so your data are always secure. In fact even if the battery is removed completely survey values and clock settings are retained. 1 x Current. Snapshot Values - Stored value is the average of all cached readings since previous store. Requires min: Pentium III with SVGA. PowerPackPro is a lot more than just data logging software package. This one is designed so that energy managers and engineers can create effective graphs and reports instantly, save carbon, money and energy from day one, and share their results with their colleagues by email with a single click. It's also very simple and friendly to use, and won't have you reaching for the User Manual every time you open it! Specifically created for SPC Range, PowerPackPro integrates seamlessly with the all the SPC devices via a hi-speed USB connection with auto-sensing built-in. Simply plug the device (or USB memory stick from your SPC Pro 2) into the PC and the software will link to it automatically! PowerPackPro is a 'task oriented' data logger software package, so even if you are not an expert in utility management it will always guide you in the right direction so that you will achieve accurate reporting first time, every time. It provides full set-up and user-control for all the instruments allowing you to define survey periods, storage rates and download schedules as well as providing additional features such a battery condition indicator and clock set function. We realise that it's results that matter most, so once data have been downloaded from the logger or USB stick, PowerPackPro really gets to work. All graphs are fully 'zoomable' in both axes, and have automatic scaling so your results are always effectively presented. X axis scrolling on zoomed graphs makes data browsing easy, and the package also features a dual Y axis function for multi-parameter charts. You can set alarm levels, and use the 'crosshairs' function to pinpoint specific events. The data logging software automatically converts logger data to the key variables of ENERGY, CARBON & COST, using the relevant calorific value, carbon equivalent and tariff information. The integrated energy costing capability allows multiple multi-rate tariffs to be entered to convert load profiles into accurate cost profiles, as well as enabling tariff comparisons to be made with real data. The 'Carbon Calculator' allows instant presentation of carbon output for all fuel types using pre-loaded or user defined carbon equivalent factors. PowerPackPro integrates seamlessly with Microsoft Office applications with 'one-click' export functions for graphs and data tables into both Word and Excel. There is even a one-click function to share both graphs and data files via email using MS Outlook! Sharing your charts with your colleagues has never been easier. The SPCMini Cable Splitter provides a quick and easy way to measure single phase loads.